16:10 Early-bird meaning of "diage"
A company, which produces and manages this complex, has raised a concept of "a place for interactions" to diage. This publication party is a place where Chinese property developers, restaurant/shop owners, and Japanese designers meet, converse, and initiate something "new." Since today is the day to interact via creativity and design -- diage is definitely the place to be. From the hotel, which the party staff is staying, diage is 10 minutes walk. In order to prepare for the day, they left the hotel as soon as they dropped the baggage. During this 10 minutes walk, they have had very first "interactions" with the local Chinese. "Wanna purchase fake bags, wrist watches?" They must have had more than 20 interactions in 10 minutes. Every interaction they had, they kindly declined the offers, but the sellers won't step back. They respond, "It's cheap" "No.1!" in Japanese to gain attentions, which are successful for 2 seconds. Many people say that Shanghai is an energetic city, and the staff was able to understand its fact physically. It's 90 minutes before the party, and the party room is still quiet and calm. 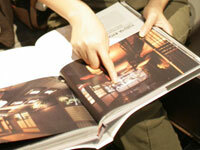 The staff gets together at one corner and checks a just-made photo book. This photo book is to be distributed to all the guests, hoping that the book and the interactions at the party lead to new Chinese-Japanese collaborative projects. "Just give it as it is." Yes, things will be all right. As the dusk approaches, neon lightening on the street becomes more visible. At the reception desk, people are moving busily for the preparation. Sorting out nametags, putting a photo book in to paper bag, checking the guest list, etc. Mr. Yuichiro Hori, the executive producer of the party, is giving directions to the staff efficiently both in Chinese and Japanese. 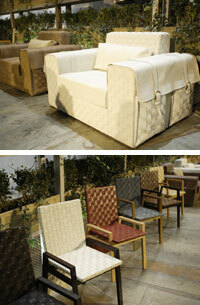 Mr. Hori established furniture manufacturing and trading company, FUSION TRADING, in Shanghai in 2003. He has been working on collaborative projects with some of the designers traveled from Japan for this party. While the other Japanese staff's voice is diminished by the surrounding noise, Mr. Hori's voice is audible all the time. Is the voice level the proof of 8 years of Shanghai life? The first event of this party is a press conference, which is scheduled at 17:30. Since the Japanese press from Japan and the local press have gathered, the press conference will be conducted both in Chinese and Japanese. It is to be held at one of the corner rooms of diage, and the room's walls are filled with 23 photo panels, which all (except one) can be seen from the book. The room is packed with about 30 press members, and some of them have to stand up. Such crowd is something the staff did not expect. 17:35 Press Conference // How do you write Nacasa and Partners in English? Press conference was hosted by the head of 3 companies. Host is Mr. Yasunaga, the general manager of MEDiA MANBU, interpreter is Mr. Hori, and the respondent for the Q&A session is Mr. Nakasa. 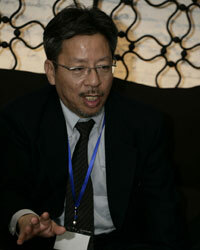 First, Mr. Nakasa gave a brief introduction of the book and moved on to the Q&A session. Q. How did you select the designers on the book? A. Fundamentally speaking, all the designers are under 40 years old, and they are all working on numerous numbers of projects energetically. Q. Is there any concept on the book? A. I deliberately choose the designers that represent the current cool Japan. Some of the local press mistakenly thought that Mr. Nakasa is a designer, and the following misinterpreted questions were asked. Q. I've heard that you are a photographer. Have you ever had any design practices in the past? A. No, I have been a photographer from my early days. It is true that I wanted to be a designer though. Q. Compared with the other nationalities, is the design fee for the Japanese designer expensive? A. I don't really know because I'm not a designer. Mr. Yasunaga: It could be slightly more expensive. Recently, many restaurants and beauty salons are opening their shops in Shanghai and most of them use Japanese designers. There was an interesting question on the name of the company. Q. When I introduce you on my magazine, should I introduce you by your name, or your company? Q. How do I write your company in Chinese characters? A. In Chinese characters? Humn … It's not written on anywhere? All right, I guess we're going to have to think about it! You tell me please! The company has its English name, Nacasa and Partners, but they've never thought about having a proper Chinese name. In the end of the conference, Mr. Nakasa gave an advice on the questions that the local press can ask to the designers here today. An interior space is not something which a designer creates solely. Opinions of owner and users are also reflected. Maybe you can ask questions like, "By blending in all these factors, how and where does a designer put emphasis when building up its design?" Or maybe you can ask, "How do you request contractors to build something with high in precisions?" The press conference ended at 18:05. By this time, the press could overhear people's conversations from the party room. The city now turns into its "night-face" and diage has also turned into a place, packed with guests speaking Chinese, English, and Japanese. 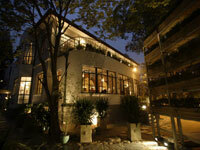 In front of the building, there is a cozy garden and guests can have a talk with a feel of breeze and tranquility. Before the press conference, there was a scattered shower and the staff was a bit concerned on the use of the garden. But now, it's all clear. I guess the enthusiasm of guests has an ability to diminish a low pressure. 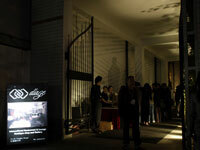 All the Japanese designers gathered in Shanghai are living through hectic schedules. In a way, this party is a reunion for them. 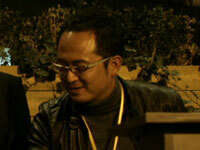 Among the crowd of designers enjoying seeing friends, there is Mr. Kazuhiko Tarumi of Ladakh Design Associates. Mr. Tarumi is one of the Japanese designers who have established a Shanghai Office. Mr. Tarumi looks back the time when he first visited Shanghai 2 years ago. "On the very first day that I stepped into Shanghai, I was like "This is the place to be." There is something in this city that fascinates people." In the early 2006, Mr.Tarumi designed "FUGA", a teppanyaki restaurant, which is build right next to Huangpu River. "When it comes to design process, there wasn't much difference between Japan and China. But I tried to consider the surrounding environment. Since Shanghai has been developing constantly, a design, which doesn't fade out by the change of the environment, is required." 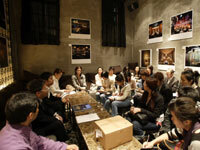 Mr. Tarumi describes the fascination of Shanghai as follows. "This is the city with a full of energy. Many people say that the Expo is the peak point of the city's urban development. But even after the Expo, I think its development process continues. This place is like a living organism." 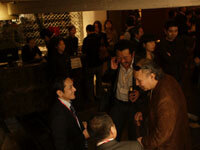 By this time, diage is packed with the guests and it's even difficult to reach to the bar counter to grab a drink. In this Japanese commuter train-like situation, where people are squeezed in a packed train, there is a gentleman who happens to know how fierce the Japanese commuting is like. Mr. Peter Alatsas, the General Manager for The Westin Bud Center, Shanghai, used to reside in Japan. Mr. Alatsas worked for Westin Miyako Hotel Kyoto and Sheraton Grande Tokyo Bay Hotel. Mr. Alatsas has been living in Shanghai for 3 years and understands a rapid metabolism of the city. "A city filled with fantastic history and culture has been untouched since the Cultural Revolution. But in the recent years, the city has been under the development and restoration, and re-developments of building are urgently required. In that sense, the demand for designers and architects are very high." When asked, "Are you intending to use any Japanese designers in one of the Westin lead projects?" "You will never know! That's the whole purpose of this party, meet new people and recognize. I wouldn't have met you today!" With a glass of wine on his hand, Mr. Alatsas responded with a grin. Many guests are moving to the garden. The greeting speech by Mr. Nakasa is about to begin. The speech is followed by a complimentary address by Mr. Yuji Kumamaru, the Counsel-General of Japan in Shanghai, then Mr. Hori, the executive producer of the party. The highlight of the series of speech session is a toast by Mr. Takeshi Nakajima, the president of KIWA Corporation, a major restaurant chains. After bringing the Japanese designers to the stage, Mr. Nakajima started his Nakajima-style speech. 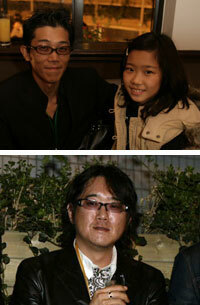 I would like to congratulate Mr. Nakasa, Mr. Hori, and Ms. Jutsukawa, who wrote texts to the book. The fellow designers please come over to the stage. And everyone, grab a glass of champagne immediately. Grab a drink, otherwise I need to continue speaking. I'm Japanese and my wife is Chinese. Both of my parents used to live in Shanghai, and I love Shanghai. A great city with a great design. Japanese, Chinese, European and American, we can all collaborate, and bringing Shanghai to more and more fascinating city. Let's hope that Shanghai flourishes even more, and everyone in here become happier. And may the peace rise in the world. Plus, Nacasa and Partners become the world's Nakasa. I guess Mr.Nakasa is already a world figure! As the toast speech ended, the guest could hear cars honking abruptly -- as if the city itself is celebrating the party. Mr. Nakajima didn't give time to the interpreter to interpret the speech to Chinese, but his speech, which was filled with his passion, surely made sense to the local people as well. On the stage, there is a series of sofas. Mr. Kumamaru, Mr. Nakajima, and Mr. Nakasa were sitting on them a moment ago. These are not ordinary sofas from stores. In fact, they are the concentration of Japanese and Chinese craftsmanship and skills. Mr. Tarumi was in charge of the design, and FUSION TRADING was responsible for the manufacturing. Tokyo-base TL Corporation was in charge of the quality control. "In the near future, China becomes a de facto for furniture manufacturing, or the entire manufacturing. By applying Japanese technology and craftsmanship, known to be one of the best in the world, I think it will create a great synergy. What I am doing now is the fusion of Japanese and Chinese technology." "Many people assume that manufacturing in China is cheap as in price and quality. I would like to eliminate the latter impression of cheap. My goal is to create a product quality that is acceptable in Japan." Mr. Yoshinori Ota, the managing director of TL Corporation claims that manufacturing in China leads to the rise in the design quality. "If manufacturing is conducted in Japan, there is a restrain with a cost. By outsourcing the manufacturing process to China, people can not only lower its budget for the production but also create some budgetary space for creativity." 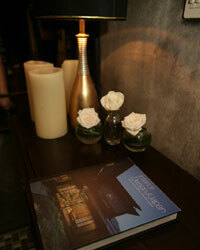 Some of the guests began talking with a photo book. 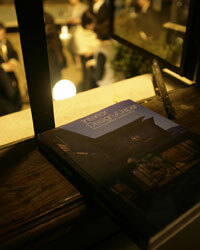 At the bar counter, there is a Chinese man, who have been talking about the book with a wide gesture. The man, Mr. Wan, is a local property developer. "What I like about Japanese design is its detail. Also, the essence of Asia and Europe are well-mixed and I think it's very interesting." Mr. Wan said on the photo book. Then he continues. "I've never worked with Japanese designers before because I had no connections. Through the party tonight, I'm happy that now I have some channels to them. I think you should organize a party like this more often." Let's keep an eye on Mr. Wan's future projects and Japanese designer's involvement. Some of the designers came to Shanghai for the first time. Due to the publication schedule, Mr. Hideki Toida's work was not included on the book. But instead, a photo panel was made and exhibited at the press conference room. Mr. Toida gave his first impression of Shanghai as follows. 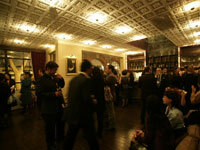 "I would love to initiate design projects in overseas, including Shanghai. Tough Japanese regulations limit the capacity of my creative expression, but in China, there's more possibility. Doing projects in overseas, that's something which all the designers desire." Mr. Yoshihiro Kawasaki of Propeller Integraters, a design firm, has a similar opinion. "I would love to go to anywhere as long as there is an opportunity for a design practice, including overseas. Design is like a universal language and it is something that people can all understand, no matter which part of the world you are from. Plus, there's someone like Mr. Nakasa, who is always initiating something new, and that encourages keep myself up as well." The party will be over at 21:00. People are moving around to see where they head to next. Some of them are shouting "It's got to be a hot pot" "Shanghai crab!" It's November, the best season for a crab. 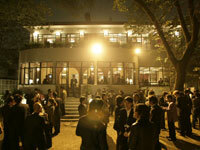 "Many people from all over the world are gathering here to pursue Shanghai Dream. In terms of the city's content, Shanghai is not as abundant as Tokyo, but relationships among people are very deep. If you don't have the right ones, you won't be able to do anything. But if you have the right ones, you can do anything you want." 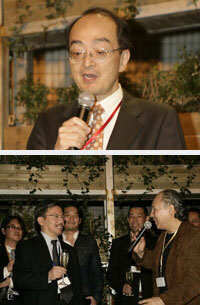 A buyer of antiques, Mr. Yoshikazu Saito of THE VINTAGE HOUSE said. Most of the guests have gone for the next dining opportunity, and a moment of silence arrives. But packing and cleaning interrupted its silence. One of the local employees carries out Mr. Tarumi’s furniture line-up. If you look at the process closely, you realize that an air bag, which surrounded the sofas for the protection, is dragged on the floor. When Mr. Hori noticed it, he anxiously approached to the track to make sure everything is loaded properly. Car honking never seems to stop, and air bags are dragged on the floor. Things and people are constantly moving in here. That’s Shanghai, and that’s what Shanghai is all about.